There are many ways to advertise, promote or generate interest in your business or services using social media today. The question is, can it help your business, and how? Strategies and ways to approach social media marketing include paid advertising and boosting posts for local visibility, increasing awareness of your company, keeping in touch with customers and more. By inviting people to follow or like your business it’s fairly easy to show them what you’re up to. You can let them know about current specials, upcoming events and new products they may be interested in. On some social media platforms you can advertise and post to reach a certain audience in a specific location or geographical area, too. The secret is to know where your audience is at and then communicate with them there. Before you jump into Facebook, Twitter, Instagram and the others, make sure you’ve got the basics covered. First, make sure you’ve claimed your Google My Business listing and that the information is current and correct. Next, make sure your website (if you have one) is also current, mobile-friendly and has good content for your new visitors. Don’t have a website? We can help. 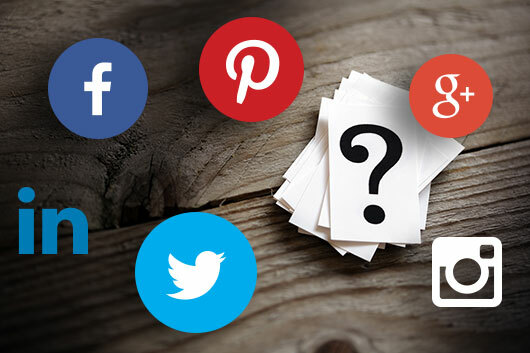 Decide what social media outlet would be best for your business and industry. Look around to see what others have done and how you can do it better. Keep your target customer in mind and make sure they are active in those places you want to be. It won’t do you much good if you market on Instagram and your audience is on Pinterest. When you’re thinking about using social media to enhance or improve your presence on the web, remember that is is a long-term strategy that requires frequent updates and monitoring to be effective. You will also want to include your social links in other advertising to build your audience and following. And you’ll need to budget time for weekly or daily posting and interacting with your audience. It’s unlikely that you’ll have overnight success, have something that goes viral or becomes an internet sensation. You probably won’t make a post that gets a million likes. But what is possible if you start small, limit exposure or risk, and test your ads or posts that you can interact with, engage and inform your customers in a way that just a few years ago was not possible. Think about how you can use Facebook and other outlets in a more personal and local way to keep in touch. While many Americans have and use a variety of different social media accounts, by far the biggest one is Facebook. It’s estimated that nearly 70% of adults that are online in the United States use Facebook regularly. It is also estimated that the usage of social media will reach a staggering 2.5 billion by 2018. It’s hard to ignore the impact of social media these days. Isn’t it time you start to harness the power of social media and make it work for your business? If you’ve got questions or would like to discuss your social marketing strategy - including advertising opportunities - give us a call at 541-210-9521 today. We make it easier and save you time by providing the professional images and graphics you need for your company social media accounts and campaigns. Sure, you can do it yourself, but you don’t have to. We’ll take your photos, images and text and create custom images that are ready to post in just a few hours. For orders placed before noon, we offer same day service and prices start at $10. Are you ready to start work on your social media strategy or have some questions? Give us a call today.